Use with caution: Visible minority, high hyperactivity/inattention score; Recent immigrant, high emotional disorder-anxiety score; Recent immigrant, high hyperactivity/inattention score. High/low behaviour was determined by the 10th/90th percentile cutpoints (as appropriate). 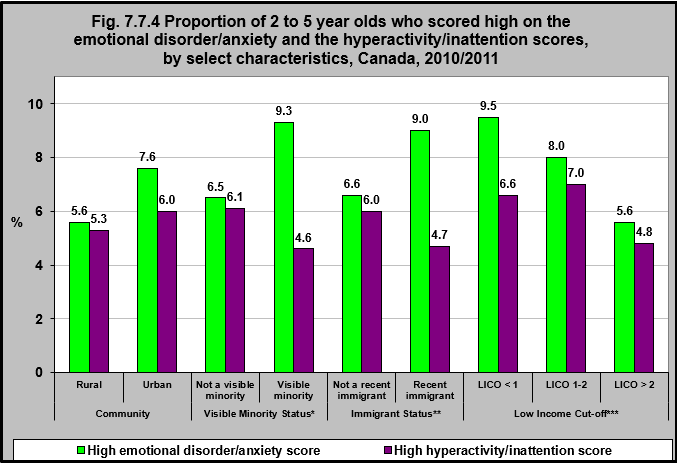 In 2010/2011, urban children were more likely than rural children to score high on both the emotional disorder/anxiety scale and the hyperactivity/inattention scale. Children who were in a visible minority group were more likely to score high on the emotional disorder/anxiety scale but less likely to score high on the hyperactivity/inattention scale than were children who were not in a visible minority group. Similarly, children who were recent immigrants were more likely to score high on the emotional disorder/anxiety scale but less likely to score high on the hyperactivity/inattention scale than were children who were not recent immigrants. Children living in the lowest income groups were more likely to score high on the emotional disorder/anxiety and hyperactivity/inattention scales than were children in higher income groups.